On my list of potential blog topics for the future, the career of Len Wein was near the top. It started with this simple question: Who was the best writer of traditional/mainstream superheroes from the 1970s through the mid-80s? Now I have stated in the past that I think Steve Gerber was the best writer of the Bronze Age, but his work was entirely idiosyncratic, non-traditional, and there was never a point when he was the regular writer of any of the mainstream superhero titles. (Unless you consider Defenders mainstream—even so, that would be the one and only title. And I’m not counting Daredevil as that was very early in Gerber’s career and he was still in the process of finding his muse at that point.) So who does that leave us? …Still, I can’t discount the earlier stuff he did that I disliked. Roy Thomas certainly did a lot of excellent work too, but his peak was the 1960s. By the 70s he wasn’t doing much of the superhero stuff anymore, as he was almost entirely consumed with the many Conan titles the line was putting out at that time. Doug Moench was also great, but again, his big work during this era was Master of Kung Fu, who was not really a superhero. Marv Wolfman did some fine stuff with Spidey and the FF (and later the Titans at DC), but for most of the 70s he was known as the writer on Tomb of Dracula—which was a superb comic, but again, outside the mainstream superhero genre. What about Steve Englehart? Terrific runs on Captain America and Avengers and Doctor Strange; then he went over to DC and did some good things on JLA and GREAT things with Batman. But a lot of his Marvel stuff (as well as the JLA stuff) was a bit too occupied with continuity and could be confusing if you were anything less than an über-geek. Plus I really didn’t like the work he did when he returned to mainstream comics in the mid-80s. So who was the most consistent writer of good, old-fashioned fun and entertaining superhero stories from that era? The answer I eventually arrived upon was Len Wein. When I look back on his body of work, there was hardly ever a story of Len’s that was less than enjoyable; I mean, his batting average was probably close to .990. In fact, Len’s got himself a résumé that sneaks up on you. It’s only when you go back and look at all of it together that you realize just how staggering his accomplishments were. Now I’m writing this Len Wein post for the worst of reasons. Len passed away this past Sunday, September 10, at age sixty-nine. Let’s go over that résumé, shall we? Wein started out doing horror stories for Joe Orlando over at DC. (The host of House of Mystery, Cain, was actually based on Wein, visually.) Then he began a regular gig on Phantom Stranger—a run I love dearly. Then came Swamp Thing, which he co-created with Bernie Wrightson—who also passed away earlier this year, strangely enough. Sidebar: I probably should have given Bernie his own write-up back in March, when he died, but honestly, I don’t have many deep, personal memories of his work, as he was getting out of comics just as I was getting started. I only caught one or two stories at the back end of the original ST series, after Len & Bernie had already left. When I went back and found the back issues later on, they were a revelation, of course. Then Wein did a bunch of really good Batman stories before a great stint on JLA (beginning with that epic 100th issue, as I discussed a year ago, in my all-time JLA-JSA countdown). He also created the Human Target during this period. Then he made the jump to Marvel. 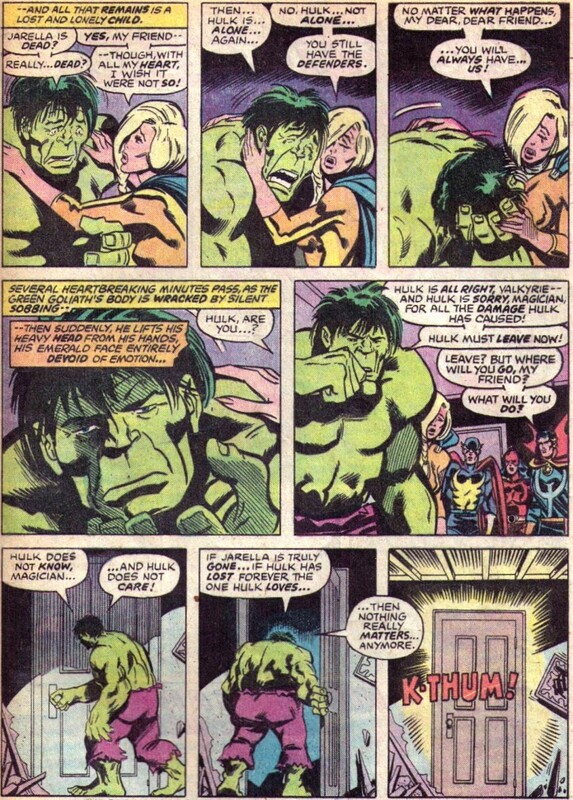 At Marvel, in addition to serving as editor-in-chief for a year, Wein had a long run on the Hulk strip (one of his two favorite characters) from Hulk #179 (Sep. 1974) through issue #220 (Feb. 1978), a run that included the creation of Wolverine. Then he would add Wolverine to the roster of his new X-Men, which he revamped with Dave Cockrum. (Additional new characters introduced here included Nightcrawler, Storm, Colossus, and Thunderbird.) He also had a lengthy writing stint on Amazing Spider-Man. Wein launched a number of successful projects at DC as an editor as well, including the Camelot 3000 maxi-series, The New Teen Titans, All-Star Squadron, Batman and the Outsiders, and Who’s Who in the DC Universe. Throw in a brief writing stint on Green Lantern during this period, too. Then he wrote the new Blue Beetle series and pitched in on George Pérez’s Wonder Woman relaunch in the mid- to latter 80s. Commercially speaking, the man had the Midas touch like no one since Stan Lee. He created Wolverine. Created the new X-Men. Was editor on Marv Wolfman & George Pérez’s Titans revival. Editor on the Swamp Thing revival, Saga of the Swamp Thing, overseeing the introduction of Alan Moore to North American comics in the process. This also led to his being editor (at least initially) of the Watchmen series. Almost every big commercial hit of the era had his fingerprints on it somewhere. Like I said, it’s a staggering résumé. Though Batman and the Hulk were his favorites, the first thing that comes to my mind when I hear Len’s name is Spider-Man. 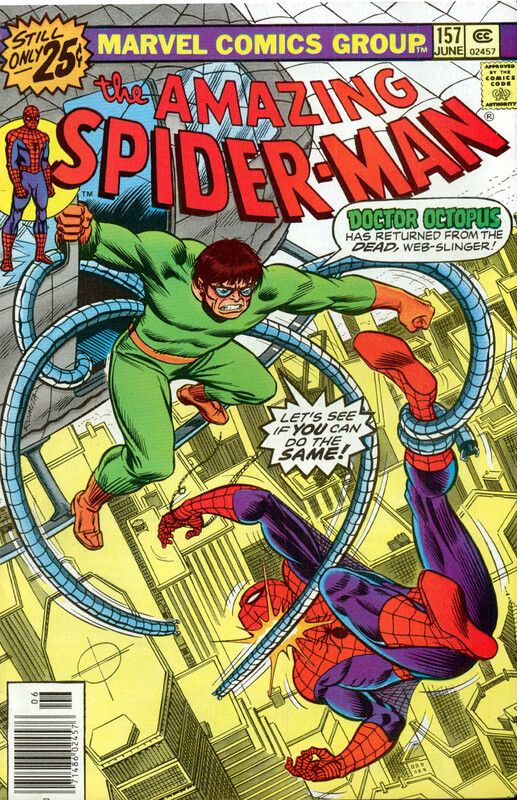 As detailed many moons ago, my first two issues of Amazing Spider-Man were 136 & 148, but when I began buying the title regularly my first issue was ASM #157, “The Ghost That Haunted Octopus!” I remember all the storylines that followed quite vividly because I was buying them and reading them as they came out each month. After that Ock-Hammerhead three-parter came the Spider-Mobile, with the Tinkerer and Toy (#160). Then the free for all with the Punisher, Night Crawler, and Jigsaw (ASM 161-162). Then the return of the Kingpin after a lengthy absence (over six years since his last appearance in ASM #85) in ASM #163. I loved this two-parter, as Len wrote the Kingpin as such an excellent foil for Spidey here that it cemented him forever after at the top of webhead’s rogue’s gallery, for me. (Credit to Marv Wolfman for somehow giving us an even better Kingpin story a couple years later in ASM #197.) It still grinds my gears that Daredevil essentially poached him as an adversary from Spidey. In any case, next was Stegron and the Lizard (165-166), as I reviewed just this past Christmas. Then Will-O-the-Wisp and a revamped Spider-Slayer (167-168). I really liked Will-O (another original Wein creation) and always thought it a waste that we didn’t see more of the character afterward. Now that I’ve brought it up, I have to say Len was truly a master of that: weaving background subplots into each and every story. The whole time Spidey was fighting the main villain of a given issue, you could always catch a glimpse of the baddie that was on deck. Wein also did a lot with Spidey’s supporting cast during this period. He finally married off Betty and Ned; brought back Harry Osborn and rehabilitated the character (prior to this, the last time we saw Harry he was a babbling mental case/LSD burnout); then paired Harry with Liz Allan; briefly made Flash Thompson into a romantic rival of Pete’s for Mary Jane, evoking their old high school dynamic for a hot minute; and then paired JJJ with Marla Madison. Most of this stuff would wind up sticking for a long, long time. 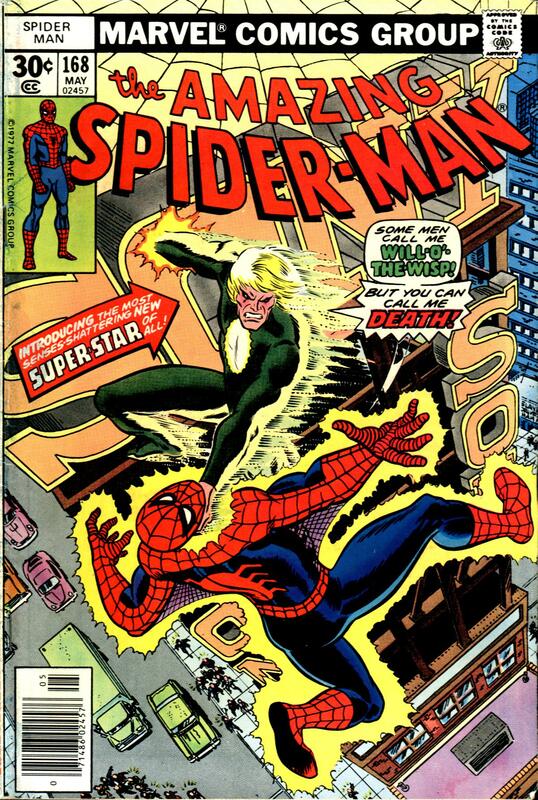 Len’s total run was almost exactly two and a half years, from ASM #151 (Dec. 1975) through #180 (May 1978). I missed the first six issues, but caught up with the stories later as I began buying back issues to fill holes in my collection circa age eleven. When I go back and read it all now, what strikes me is how stabilizing an influence Len was in the wake of the darkness and insanity that characterized Conway’s tenure (which featured the deaths of Gwen and the original Goblin, Harry losing his mind, and then the arrival of the Gwen clone, leading Peter to briefly question his own sanity). From the get-go, it feels like a great weight has been lifted from the strip. Just look at what Len gives us in his very first issue, ASM #151: We get a sane & clean Harry making his return to campus. 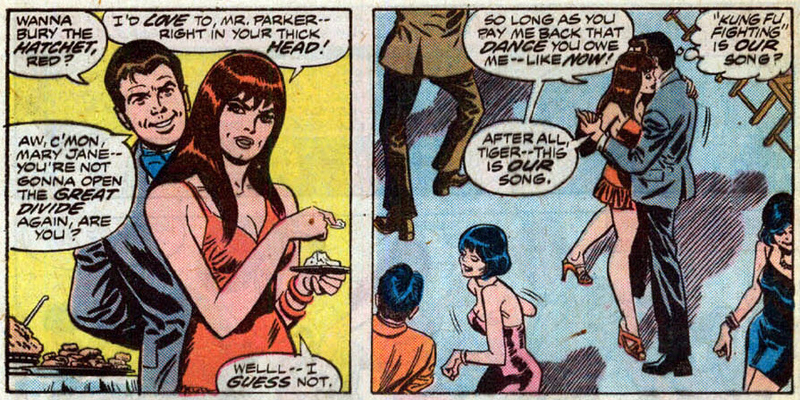 (Later, when Harry tells MJ, “my therapist says I should forget the past,” it feels like Wein is giving readers permission to forget the craziness that immediately preceded this issue.) We get an engagement party for Ned & Betty at JJJ’s apartment, with plenty of comedy courtesy of Jolly Jonah. (My favorite bit is when a portly, older woman nearly sits down on his “antique Indonesian incense burner.”) Then we get to the superheroics, and Spidey gets a pretty big clue regarding the cause of the sudden blackouts plaguing Manhattan. Is this silly? Yes, it’s dumb that a villain would “sign” his work like this (and probably impossible from a practical standpoint), but who cares? That is a GREAT visual and oh how I loved it when I first saw it as a kid. 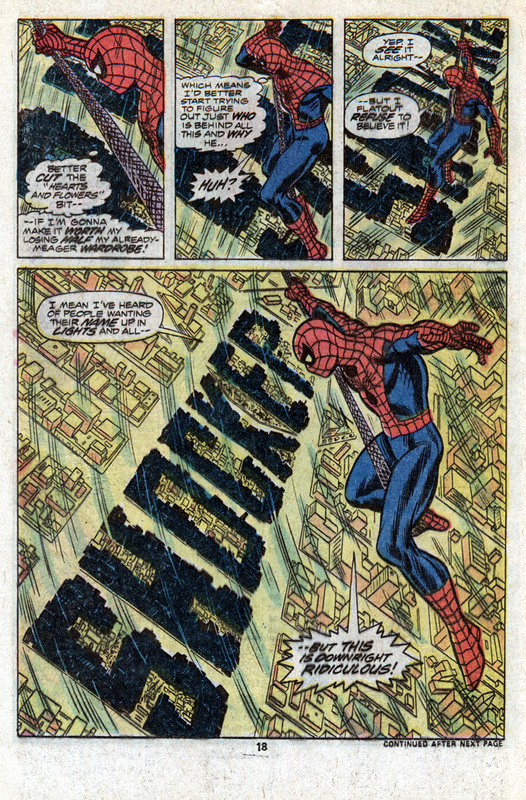 So yeah, Len Wein did an absolutely superb job restoring joy and whimsy to the pages of Amazing Spider-Man and added to my childhood immensely as a result. Spidey may not have been his favorite character, but it’s my favorite work of his. As noted back at the dawn of this blog, my first two Hulk comics were #202 and #201 (read in that order), and both were written by Len Wein. Since I already covered those, let me pick another Hulk tale by Len that hits me in my nostalgic sweet spot: Hulk #215 (Sep. 1977). For starters, just check out the cover. Now that’s a cover with hooks galore; hard for a kid to resist. The mystery villain turned out to be the Bi-Beast. This was my first brush with him and I thought he was just awesome. (I’d catch up with his first appearance in a Hulk treasury I’d pick up just a year or two later.) Sometimes the creature would speak with one collective voice in the plural first person (“we,” “our”), and other times one part of the head would speak to the other in singular first person, usually with the designation “skull brother.” Plus he/they was/were a big dude. He was one of the few characters that looked and felt like he could actually slug it out with ol’ jade jaws. 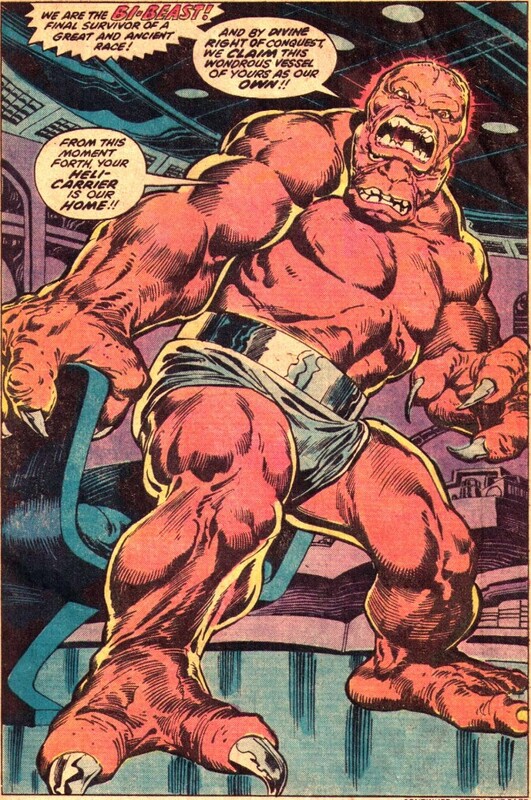 Plus the combo of Sal Buscema and Ernie Chan made him look absolutely fearsome. Check out the full-page splash where he gets revealed as the story’s villain. Again, just a great, fun story here. 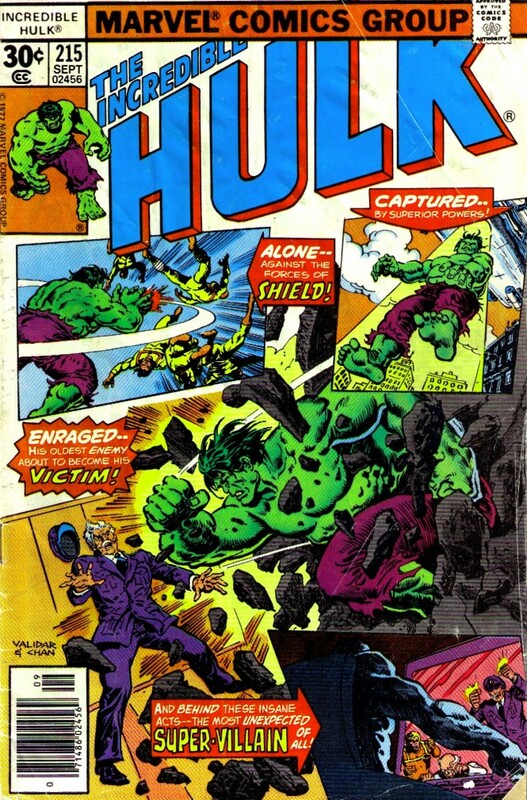 Let me juxtapose this action-packed tale with another Hulk story that really captured the Hulk’s humanity: Hulk #207 (Jan. 1977), where the green goliath is forced to come to grips with the loss of his lady love, Jarella. “But all you precious artifacts–!” Val pleads. When the Hulk’s tantrum ends, the new, grim reality finally begins to set in. The facial expressions Sal Buscema gives us in this sequence are genuinely moving—overall, quite an achievement for a silly comic book story. If the Hulk’s behavior strikes you as childish here, that’s because Bruce Banner’s Hulk persona was a child. In character terms it was note perfect. When you bought a Len Wein comic, you could always count on getting an entertaining story that remained true to the characters. But this doesn’t mean Wein was incapable of giving you more than that—he could go deeper, tell a more intimate story when he wanted to/needed to, as this story proves. …And once again, Sal’s art was superb here. What a great team they were, Wein & Buscema. Greatest Hulk team of all time? Quite possibly. And while we’re discussing all-time teams how about this one: Denny O’Neill on Detective while Len was handling Batman. Could this have been the creative height of Batman in the Bronze Age? Again: quite possibly. 13th Dimension has a great post with links to bunch of interviews with Len regarding his Batman work. CBR also has one recounting Len’s adaptation of the classic Snoopy-written tale that appeared in Detective #500. 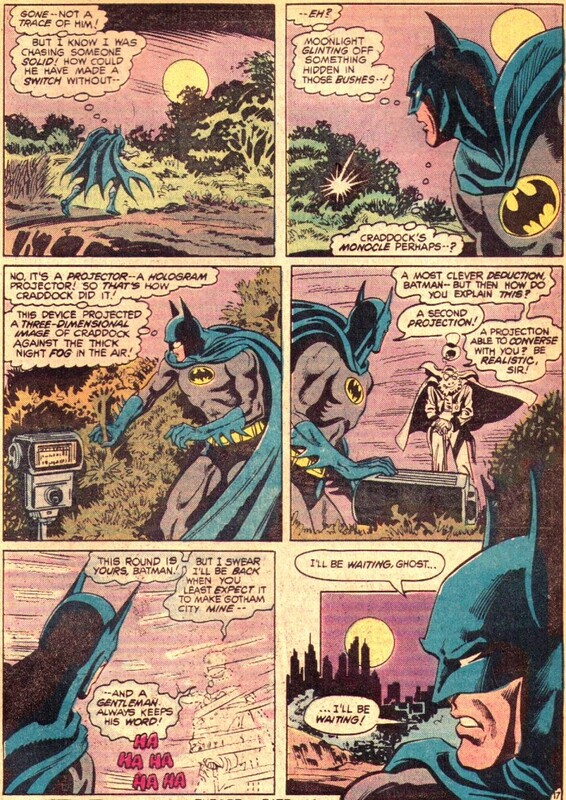 There’s a Len Wein edition of “Tales of the Batman,” and a quick Google search will get you a slew of articles on Len’s Batman work. For a personal fave of mine, let’s take a look at Batman #319 (Jan. 1980). I think I got this one as a part of a larger batch of DC books with this cover date via my aunt, who worked at Warner Brothers in the same building (75 Rock) as the main DC offices back then. 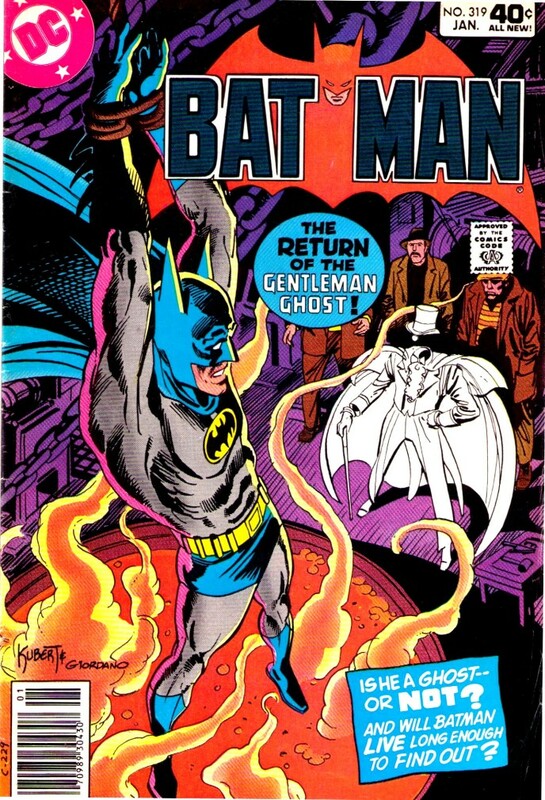 This one sticks out in my memory because it’s a good story (duh) featuring the Gentleman Ghost, who was not a Batman regular, having only gone up against the caped crusader solo once before, a few months earlier in Batman #310 (Apr. 1979)—also written by Wein. Although GG started as a Hawkman villain way back in the Golden Age, he fit really well as an adversary for Batman. In those old Hawkman tales, Hawkman was always a cynic regarding whether or not GG was a real ghost and the writer, Gardner Fox, never offered definitive confirmation one way or the other. This same approach helped the character work with Batman who, as the “darknight detective,” was certainly up for the challenge of solving the mystery of GG and his ghostly tricks. As Fox before him, Wein was too smart to give the truth away, as demonstrated in the denouement. In more recent years, the most fun thing about Len Wein was the interviews he did. His perspective as an overseer of some of the best, most popular, and critically-acclaimed comics of the 70s and 80s gave him a uniquely authoritative perspective. Most other creators wouldn’t have the bonafides nor the stones to call out iconic writers like Chris Claremont and Alan Moore, but Wein did have the bonafides and did have the stones (as recounted in this blogpost). Len is the one guy who could criticize these two because none of their work on these properties would have been possible without him. He literally created both Swamp Thing and the new X-Men. Everyone else is just playing with Len’s toys when they try to write these strips. And yes, the plot construction of the end of Watchmen does resemble the episode “The Architects of Fear” from the original Outer Limits TV series. It’s not something that I would’ve quit editing the book over, but Len did. It was something he felt strongly about, obviously. Moore has also been miscredited as coming up with the Demon’s rhyming speech pattern, but it was Wein who actually originated this in a Demon story he wrote in Detective Comics #482 (Mar. 1979). He returned to it with another story he did featuring the Demon in DC Comics Presents #66 (Feb. 1984). Now I think Moore’s rhymes were superior to Wein’s, but Len still gets credit for coming up with the original idea. And with Claremont’s X-Men, in addition to the details of Colossus’s family, Wein also hated the background Claremont came up with for Storm, pointing out that it was a rip-off of Modesty Blaise (which it was). I appreciate Wein doing this because, as stated earlier, he was the only one that could really do so—or at least the only one that could do so and be taken seriously. Len Wein was a great writer and great creator, one of the giants of the comics field. He also had integrity by the boatload. He will be greatly missed. Previous PostCaptain ConfederacyNext PostHappy 50th to the Original Spidey ‘Toon!